Taiwanese handset maker E-Ten Information Systems has launched a new Windows Mobile-based smartphone packed with GPS, computing capabilities, and VoIP software from Skype. The company has been branching out in recent years from its GPS products, and has caught onto a trend in Taiwan of developing mobile phones built around Microsoft’s Windows Mobile OS. 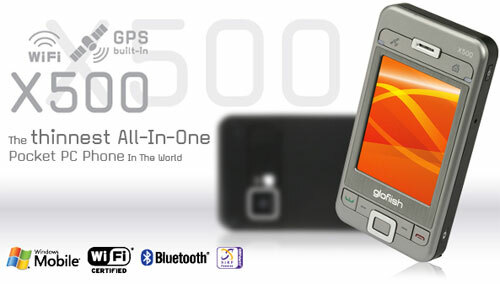 Describing the Glofiish X500 handset as a PDA with voice functions, the company is pushing its slim design, just 15.5mm, as a big selling point. The voice functions are also nothing to sneeze at. Glofiish offers quad-band GSM and EDGE (Enhanced Data Rates for GSM Evolution), as well as GPRS (General Packet Radio Service) and EGPRS (Enhanced GPRS). It also enables users to bypass their mobile phone company and use Skype when a Wi-Fi hot spot is available. The handset also takes advantage of push email from its Windows Mobile 5.0 OS, giving users full email access, IMAP/POP, and enabling the smartphone to compete with BlackBerry devices. The company also built a 2.0-megapixel camera onboard for still shots as well as video. The rest of the Glofiish’s functions can be found at E-Ten’s X500 website. The device will only be available in Taiwan for the time being and E-Ten did not provide suggested retail pricing.